This fabulous space saving corner pent shed has a very unique design. It comes with a free base coat treatment to ensure the timber is protected throughout the delivery process. Thick, robust and stylish Shiplap tongue and groove cladding is used on the walls of the building, offering a water tight design. The two fixed windows at the side of the shed add to its unique appeal. Styrene glazed, they are safer than traditional glass windows which makes this shed a great choice for those with young children. Double doors are added to ensure you have a massive amount of entry space, making it easy to store all kinds of tools and equipment. However, as it comes with a solid sheet floor we would advise adding a thicker wood sheet on top if you are planning on storing any heavyweight equipment. 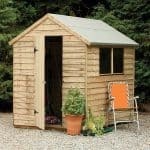 It is worth keeping in mind that although advertised as a 7’ x 7’ shed, the interior storage space you receive will be a little less than expected. This is down to the splayed front right-hand corner. This is used to ensure the double doors can be fitted at an angle. 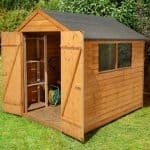 If you don’t have a lot of space available, this corner shed is an ideal choice. The pent roof also allows you to install it in areas where an apex roof would be unsuitable. The floor could do with being a little thicker. You could add another sheet of wood for additional support. 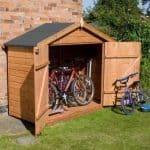 This is a space saving corner shed which benefits from an unusual splayed front corner. It offers a medium storage space, though the wide door opening gives you a brilliant amount of access. The ridge and eaves height provide you with a comfortable space to walk around in. Just keep in mind that the splayed area restricts the interior storage a little and sizes provided are based on a traditional square building. The roof of this shed has a pent design, though at the front it is very unusual due to the splayed right edge. This makes it ideal for installation in the corner of your garden and it slopes down to the right. So the roof not only directs rain down the rear of the shed, but it also sends it down to the right of the building at one side. Though the use of solid sheet materials isn’t uncommon in sheds of this price bracket, the thinness of the floor’s material is. Usually we find solid sheet floors measure 10mm-11mm thick. This one however measures just 8mm like the roof. So it’s actually not as strong as most solid sheet floors, making it vulnerable and flimsy. We highly advise you to add extra support via an additional wooden board. This won’t just give you better peace of mind, it will also ensure the floor lasts as long as the rest of the building. We can’t fault the exterior of the shed. It is built from Shiplap tongue and groove cladding. At 12mm thick, it offers extraordinary weatherproof protection and is also a deterrent to thieves. Both Shiplap and tongue and groove have their own unique benefits. Shiplap is thick and comes with a little channel between every panel that works to drain rainwater away from the walls. Tongue and groove ensures the panels interlock tightly to stop both rain and wind getting through the timber. It also has the very useful benefit of being easier to install than overlap. The interior walls are supported by a 28mm x 28mm frame. This is what you typically find on most sheds of this size and cost. At the factory the timber has been basecoat treated. This will simply ensure it is protected whilst it is working its way to you. Once assembled you will need to apply an extra treatment and then continue with annual treatments from then on. This will ensure you qualify for the sheds 10 year anti rot guarantee. The doors of the shed have been fitted at an angle to the right hand side of the building. This is the reason why the right hand corner of the roof is splayed. They come with an average height, though they do measure wider than the average door. This means as well as saving space, these doors offer you a superior level of access into the shed. It’s a shame these doors are only secured with a simple button catch however. A pad bolt would be much more effective and is what we typically find on a shed of this price. Two pretty large styrene windows are included, though due to the corner design they cannot be placed anywhere other than the left hand side of the building. They also cannot be opened. However, the styrene construction is a nice touch as it gives the windows a shatterproof quality, making this a good shed option for families with small children and pets. We are pretty disappointed with the lack of security on this building. Though it is reasonably priced for what you get, sheds in this price bracket do tend to at least have a pad bolt attached. The button catch isn’t even going to keep children out of the shed if they are tall enough to reach it. So if security is important, you will need to either buy a pad bolt and a padlock or a hasp and staple and a padlock. Privacy is pretty weak too due to the large windows fitted on the side. Although, as the walls are made from Shiplap, you could add curtains to cover the windows from the inside when not in use. Four various coloured treatments are available to give the shed a unique, attractive style. Though shiplap cladding is a lot more stylish than overlap, some people still might find the natural wooden look isn’t totally in line with their preferences. Before choosing one of these treatments however, it is worth keeping in mind that Shed Store already provide a free treatment with the shed. So if saving money is your main priority, you won’t have to worry about buying a treatment for at least a year. The garden building assembly service could be worth paying for however. 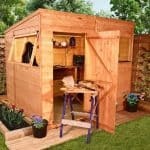 As this corner shed has a unique design compared to most other sheds on the market, it will present a few more challenges when it comes to assembly. Therefore hiring somebody to do it for you will definitely eliminate any stress and problems you would face when trying to put it together yourself. If you opt for the garden building assembly service you won’t need the last extra. The DIY assembly assistance tool kit features everything you could possibly need to install a shed, or other wooden outdoor building. A strong hammer, brushes, saw, safety gloves and goggles, spirit level and safety knife are just some tools you will find in this kit. It comes at a very low cost so could be worth buying anyway as the tools will likely come in useful in the future. 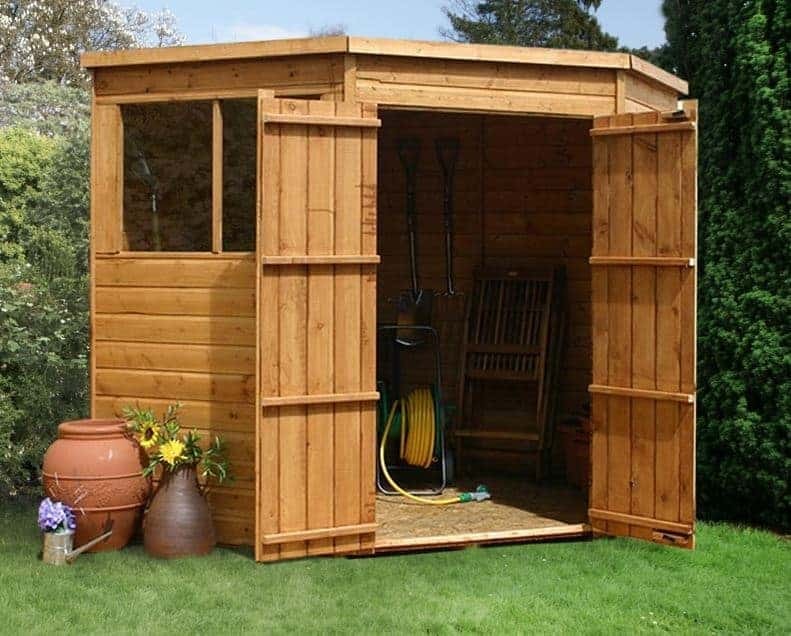 Whilst we love the unusual and space saving design of this shed, we do feel the interior quality could be improved. Externally the walls are thick and incredibly weather resistant. However, the solid sheet materials used on the roof and floor do let this shed down. The longevity of the interior will largely depend upon what you store. Without upgrading the floor, if you store heavy equipment it will cause the material to break down over time and will end up needing replacing. However, the external build is fantastic and is guaranteed to last a long time with annual treatments. The amount of space provided isn’t the same as it would be with a standard square building. Therefore you are losing out a little compared to competitor pent sheds. This is a very small price to pay for the corner design however and you also have the opportunity to add shelves or hooks to the inside walls. With an estimated assembly time of 2-4 hours, this is pretty quick to assemble considering its size and unusual design. 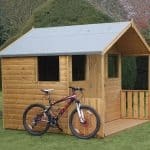 Customers have stated that the shed is easy to build, but the roof is a little on the heavy side. So it will definitely require two people to do it with ease. 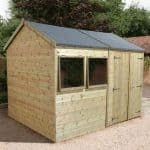 If you’re looking for a medium storage space which will comfortably fit into your small garden, this one offers great value for money. Though there are a few slight niggles such as no pad bolt and a fairly weak floor, overall it does provide good value. Final Thoughts: This truly is an attractive pent shed with a difference. Its unique corner design makes it the perfect choice for those who don’t have the luxury of a large, spacious garden. Splayed at the front to allow for the large double doors to be attached at an angle, you are given a fantastic amount of space to access the building. Though its interior storage space is a little different than advertised, it is still capable of holding a large amount of equipment and tools. We especially like the Shiplap tongue and groove clad walls, though would have liked to have seen this same high quality cladding used on the interior too.